Commissioned by the Alpha-Ville festival for the 2011 event, this interactive installation (a collaboration with Keiichi Matsuda) plays with and proposes alternative landscapes in the technological ether surrounding our everyday movements. As our identities become deliberately constructed and broadcast commodities, our projected personae increasingly enmesh and define us. Cell acts as a virtual mirror, displaying a constructed fictional persona in place of our physical form. 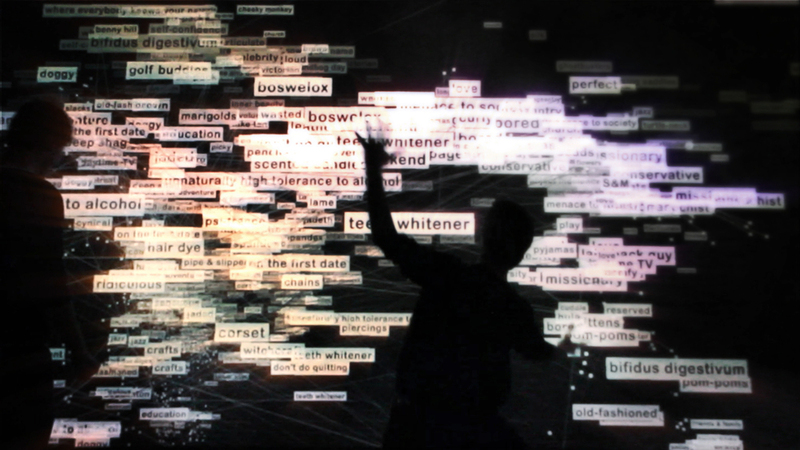 Composed from keyword tags mined from online profiles, these second selves stalk our movements through space, building in size and density over time. The resulting forms are alternate, technologically refracted manifestations of the body, revealing the digital aura while simultaneously allowing us escape from our own constructed identities. Cell uses Microsoft’s Xbox Kinect to track visitors as they interact with the installation. Microsoft have supported the project from the early stages, working with Brighton based company Matchbox Mobile and the openFrameworks community to build an addon specifically for cell that supports the Kinect For Windows SDK. Massive 'thank you's to Carmen Salas, Estela Oliva, Paul Foster, Will Coleman, Simon Hamilton Ritchie, Theo Watson, Kyle McDonald, Arturo Castro, Tim Williams, Alex Lovegrove, Nicholas Wood, Tom Hogan, Claire Holdsworth, Vincent Oliver and Iannish Posooa for their help in realising this project. NOV 2013: AUDI CITY, BEIJING. JUL 2012: CHIVAS COLLECTIVE, SHANGHAI. MAY 2012: ARTS AND BUSINESS AWARDS, LONDON (PRIVATE). NOV 2011: LBI RAVE, LONDON (PRIVATE). SEP 2011: ALPHA-VILLE FESTIVAL, LONDON. We were invited to Shanghai for a week to set up Cell in July 2012. It was for an art/music/film/food event organised by Emotion China. They had a 5×3 LCD wall erected specifically to display the piece. Cell was installed at an exhibition at Audi City in Beijing. It was always our intention to change this installation over time to implement new technologies and adapt to different contexts. In this instance we decided to give the visitors the opportunity to contribute to the piece by submitting the tags. This was achieved via a web app that would present the user with one of twenty questions such as – “Where did you meet your first love?” or “What is something you couldn’t live without?”. The answer is submitted and added to the collection of tags. Whereas the original piece would allow users to adopt the role of fictional characters, the result of this version was a crowd sourced cloud of words and phrases that formed a collective identity over the course of the week long exhibition. Some video / photos are below and you can read more about the exhibition here.